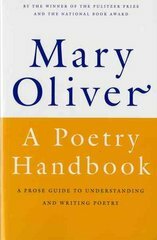 A Poetry Handbook 1 Edition With passion, wit, and good common sense, the celebrated poet Mary Oliver tells of the basic ways a poem is built-meter and rhyme, form and diction, sound and sense. Drawing on poems from Robert Frost, Elizabeth Bishop, and others, Oliver imparts an extraordinary amount of information in a remarkably short space. “Stunning” (Los Angeles Times). Index.